About 25-30 years about ago the now-defunct magazine Metropolitan Home had an article on an old service station being converted into a private residence, if I recall it was a contest winner located in Dallas. Since then I’ve been hooked on the reuse of these structures. 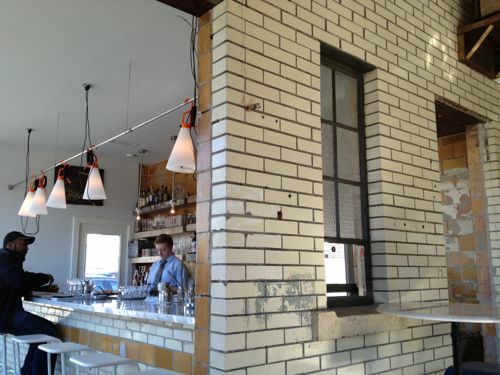 In February I posted about a formerly dumpy service station on Tower Grove that is now a trendy restaurant. Recently I passed by another vacant service station just perfect for a similar transformation. I’d passed by this same location many times before without noticing anything other than its sad condition. This time I envisioned another restaurant with a patio out front. 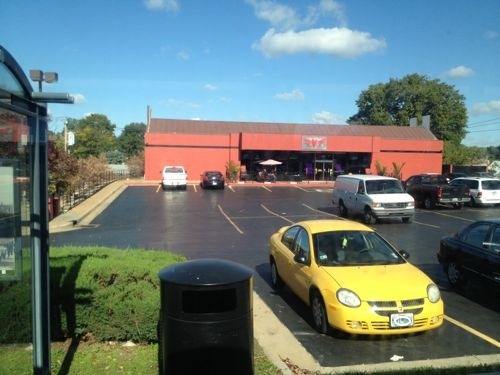 The former service station at 4175 Shaw Blvd is located just a block from the Missouri Botanical Gardens, click image for map. 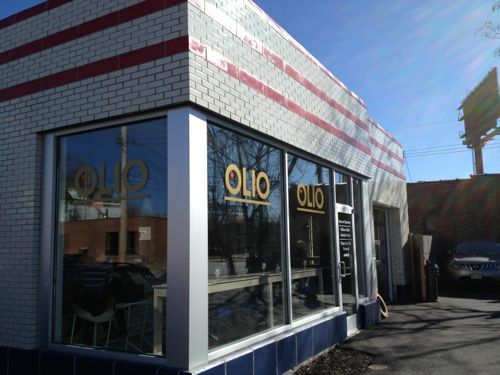 Some of you might say no market exists for food establishments in the area but no doubt that was said before Olio, Shasha’s on Shaw, and Mama Josephine’s opened. 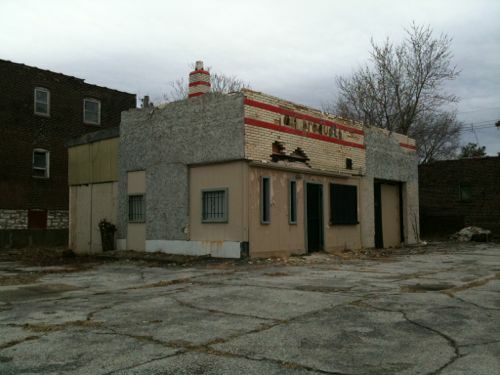 I’d love to see this building get a new life as a restaurant, coffeehouse, or perhaps a plant nursery/cafe. I don’t know the owner’s intentions, or the potential environmental issues, but I know from a purely design perspective the potential is high. Readers in the poll last week didn’t select any one option by a majority. The three routes presented as options, two being considered and another I’ve been advocating for years, each received a similar number of votes. Street cars are a joke. They are a waste. Busses offer far more flexibility. Use the old Hodiamont street car right of way. 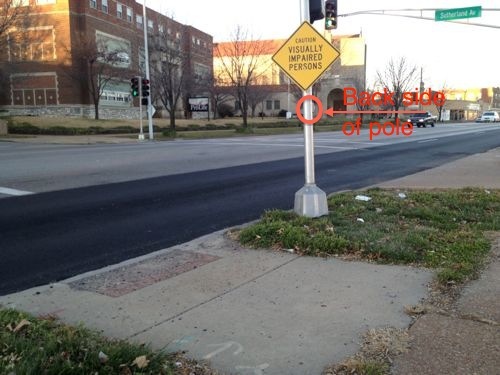 Continue on Lindell to Debaliviere/Loop Trolley connection. Middle-upper income routes to replace cars. Link “downtown” only by s.cars: riverfrt. 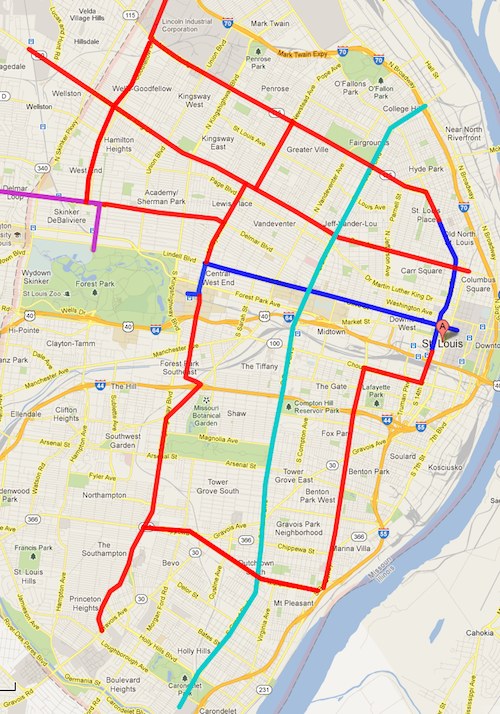 to Jeff Ave,, Delmar to Soulard. Today funding streetcars in developed urban areas takes more than available right-of-way, it takes enough demand to justify the investment in infrastructure. Often this means connecting some big dots, the in between will fill in over time with proper land use controls. The problem in St. Louis is our big dots are generally east-west between downtown and Clayton. What big dots exist north & south to guarantee ridership on a daily basis? Okay, suppose you connect these via streetcar — that’s a mile and a half length. Not bad, but you’d still have to run the #70 (Grand) MetroBus to reach areas north and south — an additional 7.5 miles. Even my longtime preferred route of Olive/Lindell to Vandeventer to Delmar doesn’t have enough dots to get funding. The dots aren’t there for an initial north-south line but extending a couple of miles here and there every few years would eventually build a system. The current proposal calls for a north-south piece at 14th Street, going up to St. Louis Avenue. The double track on Taylor of Option 1 provides an ideal spot for a second north-south line further west. Expansion could happen to reach new development projects. Yes, what I’ve shown above would take decades to construct. That’s how long-term planning works. For further reading on streetcars please see a 65-page literature review of Relationships Between Streetcars and the Built Environment. Nearly two years ago, March 18, 2011, ground was broken on a rehab & new construction project called Botanical Grove, west of Botanical Heights and part of the area once known as McRee Town. The main focus that day was residential — rehab of existing buildings and new modern infill. I was there and thrilled by the ambitious plans of the developers. The work continues but many of the residential units are occupied by homeowners. 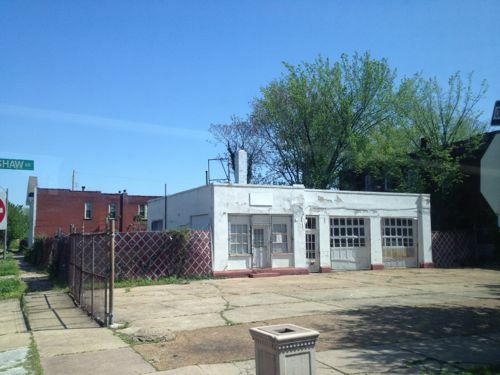 I was also skeptical about the future of a tiny little former gas station at the corner of McRee & Tower Grove Ave. I could see the appeal and potential but I knew the lending climate that existed, would anything come of the idea to remake the gas station? In a word, yes! 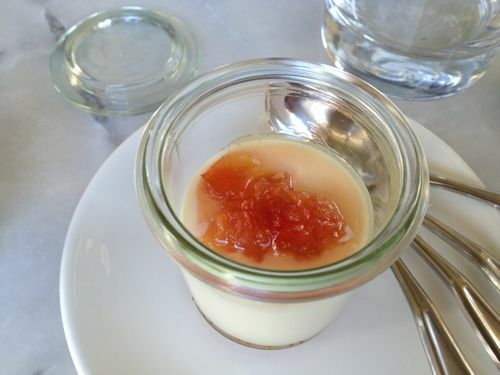 ABOVE: On February 16, 2013 I visited Olio with friends. Olio had been open a few months at this point. Click image for Olio’s website. Some will say gentrification, the affluent are pushing out the poor. I see a once decrepit structure brought back to live bringing in tax revenue for the city and employing people. Botanical Heights to the east employed the cleared earth strategy of urban renewal but Botanical Grove kept and rehabbed many existing structures and infilled on vacant lots. Many housing types were offered as a result. In June I did a post about being unable to active a pedestrian signal at Kingshighway & Devonshire (see Pedestrian Signal Activation Button Beyond Reach). That button got relocated after I pointed out the absurd location. Last week I used the next crossing to the north, at Kingshighway & Sutherland. 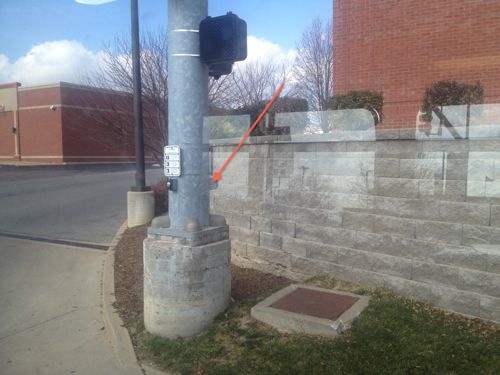 Yes, you guessed it, another pedestrian button not reachable from the sidewalk. ABOVE: Why bother putting a button at all if it can’t be reached? ABvOVE: A woman waited on the other side of Kingshighway also waiting for the walk signal to come on. I eventually wheeled into the grass to press the button because it didn’t seem like it would change without doing so. Even after pressing the button it took many minutes to give the ok to cross the street. A week earlier I spotted another problem button from the #11 (Chippewa) MetroBus. ABOVE: The 2nd button to cross Chippewa is located in an impossible to reach location. The Chippewa button I emailed in to the Streets Dept while I was still on the bus. I’m notifying the city of the problem at Sutherland via this post. To be fair, many intersections are great for pedestrians.But we tend not to remember that which works like it should, we remember those that give us fits. 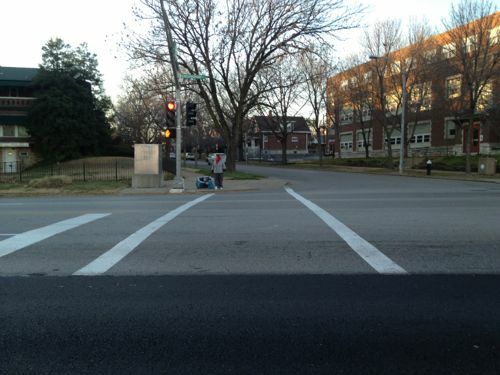 Eventually I hope to gather volunteers and do a pedestrian audit of an area — signals, crosswalks, ramps, etc. In the meantime I’ll catch them one at a time as I go about my daily life in various parts of St. Louis. Buildings are largely permanent structures, although a demolition crew can change that quickly. Much of what we build stays with us for decades. Lowest common denominator auto centric structures, such as gas stations, seem to live on forever. Early gas stations of the 1920s were small, much closer to the sidewalk and had details similar to housing of the day. Today these are often viewed as charming. 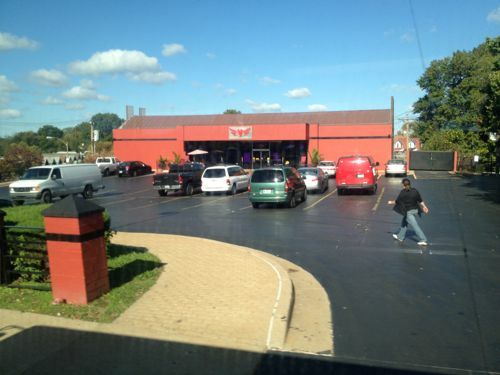 ABOVE: The former QT on Gravois in the Bevo area is something new, not sure what though. Get off the bus or just walk down the sidewalk this spot is an urban void. What are the hours of this business? A menu? Heck, how do I even get to the front door? ABOVE: The former convenience store structure built in 1991 is set far back from the sidewalk unlike adjacent properties. Check out the aerial on Google Maps here to see how this is a radical departure from the long-established commercial district. This never should’ve been built 21 years ago. Too late for Bevo but we must prevent further such atrocities to happen to our urban commercial districts. Hopefully I’ll see the day a new 2-3 story commercial building is built, up to the sidewalk, on this site.